Tonight was my Westhampton Public Library talk. Westhampton’s about two hours from me. Which means an opportunity to hit some oddity around the way. And I was really looking forward to tonight. The only downside was that my family couldn’t come because my eldest’s school wouldn’t be getting out in time. So I made a plan. A plan I loved. I was going to leave early, enjoy a leisurely drive to the library listening to horror movie podcasts. I would then stop on the way at a cylindrical bar built into an actual tunnel, enjoy a martini or two, a small dinner, check the bar off my OTIS Map, and them be nice and cozy for my talk. But I messed up the logistics. I followed a bad route, got to the bar late, realized it was farther from the library than I’d thought and that the bar opened later than I thought. I parked in front of the bar, agonizing over the decision. And then I decided. I drove away, hit up a McDonald’s drive-thru for some fries, and kept going. Although that did give me the chance to learn about McDonald’s “Trick. Treat. Win.” contest on a bag decorated with slime and bats. Once off the highway, I still had a ways to go, and I drove through towns and farmland and residential areas and city and flocks of turkeys all minutes from each other. That’s New England--and the whole East Coast in general. Every landscape packed into a small space. And it was about then that the stomach-horrors hit me. This is how it usually goes for me with talks. I don’t search them out, but when somebody inquires, I invariably say yes. Then I forget about it for months. About a week before, I get a little excited. And then the day before I start dreading it. And then on the drive to the event, I start really hating myself and life and the universe. Is anybody going to show? Why would they? Why am I doing this anyway? What’s the purpose? What am I getting out of it? What is an audience getting out of it? This is dumb. Nobody cares. I’m not a speaker. It always lasts a full hour before the actual event. I pulled into downtown Westhampton, which is criminally quaint, with its classic, giant white church thrusting its long, pointy steeple into the sky. The library was right across the street. It was just getting dusk enough that I could see into what I assumed would be the room where I would give my talk, since it was full of chairs. Empty chairs. I was about 30 minutes early, so I drove through some farmland for a bit, admiring the corn and the burgeoning Fall colors on the trees, and then bit my lip and drove back to the library. There I met Lynn, who was really nice and helped me set up. There were about three people in the chairs at this point. I had about ten more minutes to kill, so I hid in a small kitchenette off the side of the community room. When I came back into the room at 6:30…it was a full house! I don’t know, maybe 30 or so people? More than enough to show photos of creepy places in Massachusetts that I’d visited. I guess the talk went fine. I said the word schlub and schlubby too much. They’re not even words in my vocabulary. I stuttered, spoke fast, broke the projector at one point. Generally the whole me-in-front-of-people deal. 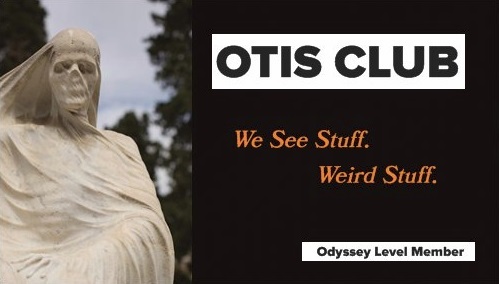 Afterwards, I answered questions and was educated on some great oddities from the audience that I can now add to my OTIS Map. And then afterwards, I got to meet some cool people. A couple of readers who brought their copy of The New England Grimpendium and told me about their own trips, an ex-mortician who drove up from New York (!!) just to hear the talk. And two gods-honest OTIS Club Members (Michelle and Steve!). And then I got home to Facebook messages from other people who attended. That made my night and is really the reason why I do these talks. To learn about new oddities and to meet fellow weirdos. The drive home after a talk is always euphoric. I can’t wait until my next talk, in Salem, on October 13. I just have to get through that hour of stomach-horrors. And get there early enough that I can fit in a martini beforehand. Anyway, time for bed. I have to get up early, head into Boston for work, leave there early, come home, and then go to Salem to dodge the Halloween parade and see Elvira introduce a 30th anniversary screening of Elvira, Mistress of the Dark. Yes!